Chandler is a progressive city with hometown traditions, golf courses and resorts. The city is located in Maricopa County as a suburb of Phoenix. Chandler is warm and sunny with over 300 sunny days on average annually, and an average temperature of 85 degrees. The sunny town’s history starts back when the state’s first veterinarian surgeon, Alexander John Chandler, settled on a ranch nearby. He owned about 18,000 acres of land by 1900. Chandler drew up plans for a town site on his ranch, and by 1912, there was a town site office and high school established. Hotel San Marcos, the first golf resort in Arizona, came in 1913, and the Williams Air Force Base in 1941. This all brought a small boost in the population. Then, from 1950 to 1980, the population grew from 3,800 to over 30,000. The city has continually flourished ever since. 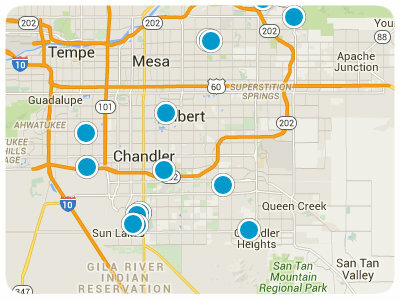 The communities in Chandler are a definite factor bringing people to the area. The homes come in various price ranges, sizes, and styles. 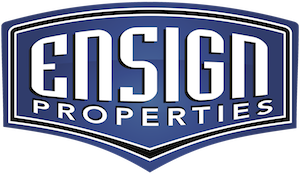 Some of the best neighborhoods include Fulton Ranch, Ocotillo, Sun Lakes, Ocotillo Lakes, Circle G at Riggs, Layton Lakes, Andersen Springs, Sun Groves, Vasaro, and Riggs Ranch. Fulton Ranch is a 520-acre master planned community that offers multi-million-dollar custom homes, single family homes, and luxury townhomes. The neighborhood is within walking distance of Fulton Elementary School and Fulton High School. Ocotillo is a golf resort and gated community. Ocotillo has 138-acres of lakes, providing gorgeous lakefront homes and boating access. The 27-hole golf course was designed by Tod Robinson. Sun Lakes provides a resort vacation lifestyle to residents. The country club subdivision offers gated communities, five adult country club communities, several golf courses, five club houses, restaurants, cafes, heated pools, hot tubs, tennis courts, whirlpools, saunas, and so much more. Ocotillo Lakes is another waterfront community, but this community has five different lakes. Ocotillo Lakes is very close to high companies such as Intel, Motorola, and Orbital. Circle G at Riggs is a community with custom built homes and wide open spaces. There are large lots with semicircular driveways, providing lots of opportunity for further customization. Layton Lakes has amenities no other neighborhood in the area has. Residents can enjoy a main community park with a ramada, a volleyball court, a large splash pad, a fishing deck, a jogging track, and a playground. The homes in Layton Lakes are constructed with high quality standards and superior design. Sun Groves is a relatively new community in Chandler. This is the perfect commuter community with a variety of home styles, quiet neighborhoods, parks, and sport courts. Every neighborhood in Chandler plays a key role in creating the active upscale community it has become today. The Apache Trail and Superstitious Mountains are nearby and provide over 40 miles of winding roads, incredible scenery, hiking, forests, cacti and lakes to explore. Spend a day or two outdoors, catch some fresh air, and see a taste of the beauty that Arizona has to offer. Arcosanti is another cool place nearby. It’s an experimental town based on Paolo Soleri’s theory of compact architectural environments. Arcosanti is a bio-climatic architectural environment that reflects innovative construction techniques. Explore Soleri’s theory brought to life through the opportunities provided to live, work, and participate in the cultural and educational workshops at Arcosanti. The Chandler Fashion Center is a shopping mall that will satisfy all of your shopping needs at stores like Free People, Pottery Barn, Sephora, Hollister, Disney, Michael Kors, Nordstrom, and more. The Desert Breeze Park is a fun-filled family-oriented park geared towards children. Bring your little ones for the carousel, train rides, and snack bar. When you start to feel hungry, Chandler provides a wide variety of restaurant selections for everyone to enjoy. If you are looking for a very special night out, try Kai Restaurant. This restaurant provides superior fine dining on any occasion. The food and service are spectacular, and the atmosphere is very upscale. The menu selections are to-die-for. The breakfast menu includes breakfast tacos, seasonal steel cut oatmeal brulee, honey oat waffles, huevos rancheros, mimosas, and bloody marys. For lunch, try the chicken tortilla soup, salad, or fish tacos. For dinner, try some of their famous pork wings, filet mignon, or the bacon wrapped buffalo meatloaf. Any of these options are sure to satisfy your deepest cravings. If you’re looking for something a lot more affordable and enjoy Italian food, head over to Floridino’s Pizza and Pasta. This family-owned restaurant is well-known for their pizza muffins and monster-sized calzones, also known as the World’s Largest Calzone. This place is family friendly, affordable, and delicious. A couple of other suggested menu items include their lasagna and Sicilian sundae. If you prefer a nice medium of affordable, yet classy, try Firebirds Wood Fired Grill. The atmosphere is great and so is the food. The steaks are especially popular at this restaurant; The customers rave about it. This restaurant is near a mall, so walk off all the yummy food on afternoon or evening walk through the shops. Chandler is a dynamic and successful city, and it continues to improve and prosper for its present and future residents. The golf, the community, the scenery, the food, and the outdoor opportunities bring exponential growth and happiness to the city and surrounding areas.